Duane Daugherty of Mr. Doggity's Foods spices up the classic, cereal-based snack mix with loads of local flavor. Prepare this savory blend for a Super Bowl party or any gathering. Savory Addictions and Olive Tree are local companies - substitute alternate brands as desired. In a large bowl, combine 3 cups each of Corn Chex, Rice Chex and Wheat Chex cereal, 1 cup Savory Addictions Gourmet Nuts (savoryaddictions.com), 1 cup pretzels, 1 cup "Hot & Spicy" Cheez-Its, 1/4 cup Olive Tree butter-flavored Olive Oil (olivetreekc.com), 1 tablespoon Worcestershire sauce, 1 teaspoon seasoned salt and 2 teaspoons Mr. Doggity Foods Bajan-style hot sauce. Spread thin on cookie sheets and bake at 250 degrees for 1 hour. Mix well and serve. 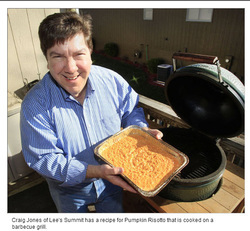 Craig Jones of Lee's Summit has a recipe for Pumpkin Risotto that is cooked on a barbecue grill. Craig Jones will enjoy these last days of December as the reigning Grill Mayor of 2012, a title he won after receiving more than 4,000 online votes in a national contest sponsored by McCormick brand and the Food Network. Jones has genuine grilling enthusiasm, as he cooks outside on his collection of seven grills and smokers more than 300 days out of the year. Gay, Jones’ wife of 19 years, is his biggest culinary cheerleader and most trusted taste-tester. Jones’ passion for live-fire cooking inspired him to create Savory Addictions gourmet nuts, a product that fuels his grilling ingenuity. What was the grilling tip you shared to garner the national “Grill Mayor” title? People who want to cook outside should get to know their grill and cook with it using direct- and indirect-heat methods. Almost any recipe and cooking technique can be performed on the grill. Don’t limit yourself to just barbecue recipes. Any recipe you can do inside can be converted to cook outside, which is a heck of a lot more fun, and of course tastes much better. Is there a difference between barbecuing and grilling? I really don’t barbecue very much in the traditional way people think of Kansas City-style barbecue. I just love to cook outside. My first grill was a gas one, and the food I made on it was not very good. Now I grill over a live fire and use charcoal and hickory, apple and cherry woods to help flavor the meat. It’s a quest of mine to tinker with recipes you might only make in the kitchen and adapt them in such a way that they are grill-friendly. You've said after a snowfall you’re more apt to clear a way to your grills than shovel the sidewalk. What inspires your love of grilling outdoors, despite the weather? I usually grill over an indirect heat, so I’m not staying outside the entire three hours something is on the grill. But I do love the flavor smoke imparts to a dish. I grew up in the Kansas City area, and my dad was not particularly good at the grill. He would always say that my mom treated us like gods, because she would offer us burnt offerings, so she wasn't a terribly good cook, either. Because of that, I learned early on how to fend for myself in the kitchen for my brother and me. Today, I love Jamie Purviance, because he does a lot of recipe development for Weber Grills, and Alton Brown, because he gets into the chemistry of cooking. So how did you develop this recipe for no-stir, on-the-grill pumpkin risotto? This recipe borrows inspiration from Ina Garten's no-stir risotto recipe, but I wanted to infuse it with a flavor that had been kissed by smoke. It started with grilling a pumpkin and then playing with it. That’s how I started making Savory Addictions gourmet nuts. Someone at work challenged me to make a snack on the grill. Now, we have five different varieties we sell online and at about 20 local retailers. Right now, I’m smoking more than 100 pounds of nuts every weekend. While it doesn't replace my day job, there’s a lot of flavor and fun that goes into everything I grill. Prepare a hot fire on one side of a charcoal grill and set grate on highest setting. (To imbue a smokier flavor, add your favorite wood chips.) Make sure you keep fire hot throughout entire cooking process. Prepare pumpkin by cutting off the top and setting aside. Hollow out pumpkin, removing seeds and strings. Replace top on pumpkin and set on the side of grill without coals. Place lid tightly on grill and smoke pumpkin over indirect heat for 1 1/2 to 2 hours, or until very soft. Carefully remove pumpkin from the grill and allow it to cool. Scoop out the flesh of the pumpkin and set aside. Stir rice and 4 cups chicken stock together in a large cast-iron pot or disposable aluminum pan. Set pan/pot on side of grill without coals and place lid tightly on grill. Remove lid every 10 minutes to stir and keep on grill for 35 to 45 minutes, or until most of the liquid is absorbed and rice is al dente. Carefully remove pan/pot from grill, and stir in remaining chicken stock, Parmesan cheese, sour cream, wine, butter and smoked pumpkin. Stir vigorously for 2 to 3 minutes, or until rice is thick and creamy. Season with salt, pepper and nutmeg. Serve hot. Note: This recipe can also be made in an oven, set to a temperature of 350 degrees. Per serving: 316 calories (40 percent from fat), 15 grams total fat (8 grams saturated), 32 milligrams cholesterol, 35 grams carbohydrates, 15 grams protein, 705 milligrams sodium, 1 gram dietary fiber. Craig Jones, owner of Savory Addictions, shows two easy side dishes that you can grill for Thanksgiving. Craig Jones of Lee’s Summit, Missouri loves to smoke, no doubt about it. Not cigarettes, mind you. He’s a grill man that loves to smoke just about any food you can imagine. His dedication to grilling and smoking recently earned him notoriety. Jones has been named Grill Mayor of 2012 in a national online contest sponsored by McCormick’s and hosted on the Food Network lifestyle network. The contest invited grill enthusiasts from around the country to give a key grilling tip accompanied by a photo. Jones’ “Master of the Grill” entry garnered over 7,777 views and more than 4,000 votes of online support during 20 days in August. As the new Grill Mayor of 2012, Jones will be flown to New York City for a private tour of the Food Network studios and have dinner at a Food Network chef’s restaurant, among other prizes. Jones’ grilling enthusiasm even includes nuts. 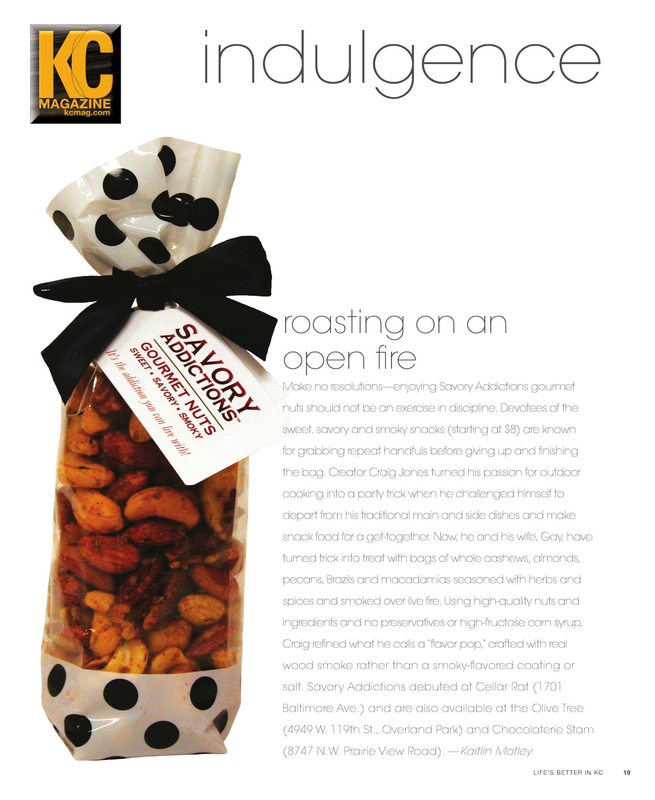 He created a business based on a signature item that he created on the grill – Savory Addictions® Gourmet Nuts. 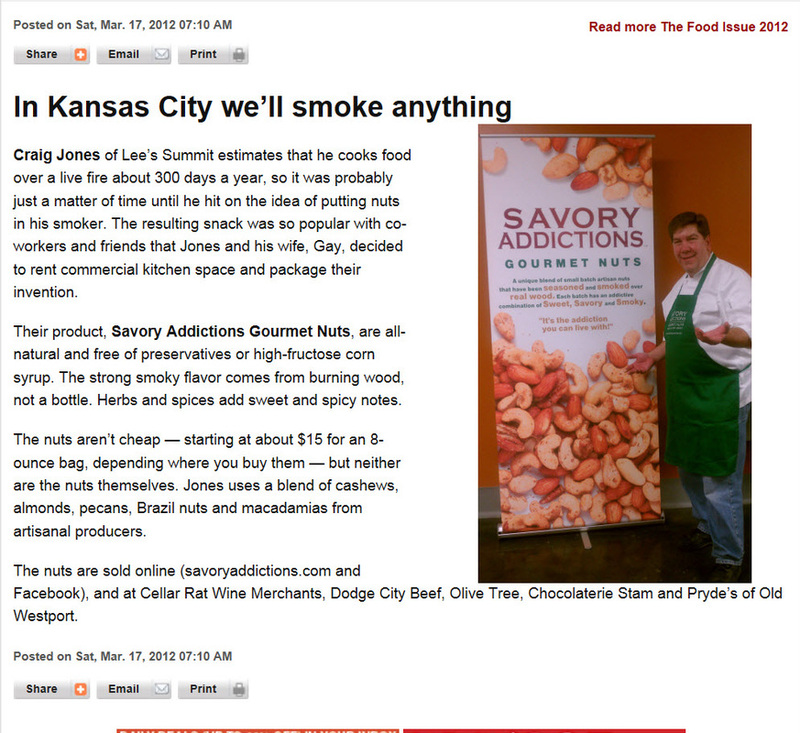 Savory Addictions Gourmet Nuts are available online as well as in several Kansas City specialty retailers. The Kansas City Star Food Issue 2012 listed Savory Addictions #2 on a list of 35 “people, places and things that make us drool” and that make Kansas City a great food town. Jones’ Super Savory Cheese Ball recipe appears in the cookbook Last Bite: 100 Simple Recipes from Kansas City’s Best Chefs and Cooks, due out in late October from Kansas City Star Books. The book was edited and written by Pete Dulin and features vivid color photographs by Roy Inman. Savory Addictions Gourmet Nuts (cashews, almonds, pecans, Brazils and macadamias) are small batch artisan nuts, seasoned and smoked over real wood for sophisticated palates. The flavor is an addictive blend of sweet, savory and smoky. 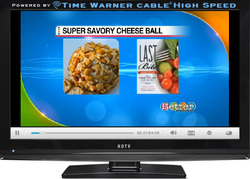 Savory Addictions contains no food colorings, MSG, high fructose corn syrup or preservatives. They are proudly hand-crafted in the greater Kansas City area. Ask Craig Jones of Lee’s Summit and he’ll tell you. In September, Jones was voted Grill Mayor 2012 in a national online contest sponsored by McCormick’s seasoning and hosted on the Food Network lifestyle network. The contest invited grill enthusiasts from around the country to give a key grilling tip accompanied by a photo. Jones’ “Master of the Grill” entry garnered more 7,777 views and more than 4,000 votes of online support during 20 days in August. Thing is Jones didn't start campaigning for votes until more than halfway through the contest. Jones said he cooks outside on his collection of seven grills and smokers more than 300 days a year. His passion for live-fire cooking inspired Jones and his wife, Gay, to create a business based on a signature item he created on the grill – Savory Addictions Gourmet Nuts. Jones seasons deluxe nuts by hand in small batches, and then smokes them over real wood, creating an explosion of sweet, savory and smoky flavor that permeates the nuts. Savory Addictions Gourmet Nuts are available online ( www.savoryaddictions.com) as well as in several Kansas City area specialty retailers, including A Thyme for Everything and The Red Door Wine Store in downtown Lee’s Summit. 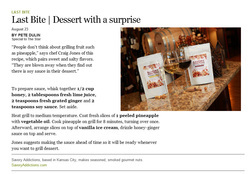 The Kansas City Star Food Issue 2012 listed Savory Addictions No. 2 on a list of 35 “people, places and things that make us drool” and what makes Kansas City a great food town. As Grill Mayor of 2012, Jones and his wife will fly to New York City next June for a private tour of the Food Network studios and have dinner at a Food Network chef’s restaurant, among other prizes. The couple plans to enjoy the sights and sounds of the Big Apple, but also use the experience as a chance to spread the word about their savory concoction. “I’m really excited and really for a couple of different reasons,” said Craig Jones, a workforce management specialist at Sprint. His co-workers there are the ones who inspired the Joneses to create Savory Addictions. “I watch Food Network a lot and I think it would be cool to go to the studios and see what it’s like. I think it would be cool to see what that process is like there. As for the title of Grill Mayor 2012, Craig Jones won with one simple tip: “Any recipe that you can do inside can be converted to cook outside....which is a heck of a lot more fun...and of course tastes much better,” the winning entry stated in part. To prepare sauce, whisk together 1/2 cup honey, 2 tablespoons fresh lime juice, 2 teaspoons fresh grated ginger and 2 teaspoons soy sauce. Set aside. Heat grill to medium temperature. Coat fresh slices of 1 peeled pineapplewith vegetable oil. Cook pineapple on grill for 8 minutes, turning over once. Afterward, arrange slices on top of vanilla ice cream, drizzle honey-ginger sauce on top and serve. 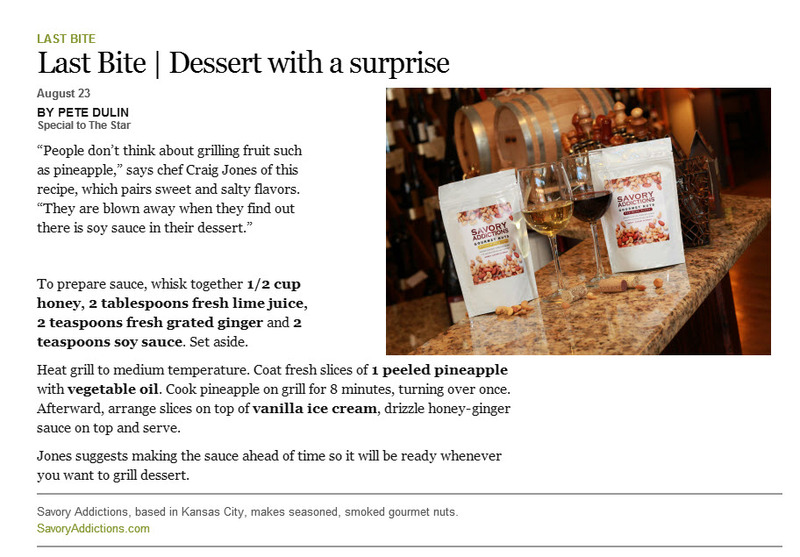 Jones suggests making the sauce ahead of time so it will be ready whenever you want to grill dessert. Craig Jones of Lee’s Summit estimates that he cooks food over a live fire about 300 days a year, so it was probably just a matter of time until he hit on the idea of putting nuts in his smoker. The resulting snack was so popular with co-workers and friends that Jones and his wife, Gay, decided to rent commercial kitchen space and package their invention. Their product, Savory Addictions Gourmet Nuts, are all-natural and free of preservatives or high-fructose corn syrup. The strong smoky flavor comes from burning wood, not a bottle. Herbs and spices add sweet and spicy notes. The nuts are sold online (savoryaddictions.com and Facebook), and at Cellar Rat Wine Merchants, Dodge City Beef, Olive Tree, Chocolaterie Stam and Pryde’s of Old Westport. 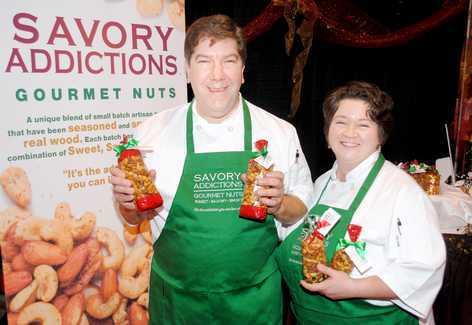 Local area couple Craig and Gay Jones launched Savory Addictions Gourmet Nuts in October of 2011, after friends, coworkers and total strangers kept asking for more after sampling test batches. The sweet, savory and smoky flavor is unlike anything found on the market today, and took over five years to perfect. Many describe the taste as reminiscent of nights around a campfire…cozy, comforting, exciting. According to co-owner Craig Jones, “It’s a flavor-pop in your mouth.” The formulation was born of his passion for producing great flavor over live fire. Jones cooks over live fire 300-plus days of the year, even during Kansas City’s extreme weather swings. In honor of Valenitnes Day, Savory Addictions has created a sweet blend. The Sweet Addictions blend contains, Savory Addictions signature smoked nuts, a new seasoning, dark bittersweet chocolate, and tart Montmorency cherries. This Sweet Addictions blend is only available for a limited time. 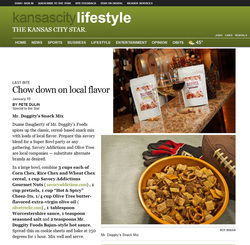 Savory Addictions Gourmet Nuts are currently available in the Kansas City area at Cellar Rat Wine Merchants (Kansas City), Dodge City Beef (Shawnee), and Olive Tree (Overland Park), as well as online at www.SavoryAddictions.com. Savory Addictions Gourmet Nuts (cashews, almonds, pecans, Brazils and macadamias) are small batch artisan nuts, seasoned and smoked over real wood. These nuts have a flavor unlike anything on the market today – an addictive blend of sweet, savory and smoky. Savory Addictions contains no food colorings, MSG, high fructose corn syrup or preservatives. They are proudly hand-crafted in the greater Kansas City area at the Ennovation Center, a certified commercial kitchen. 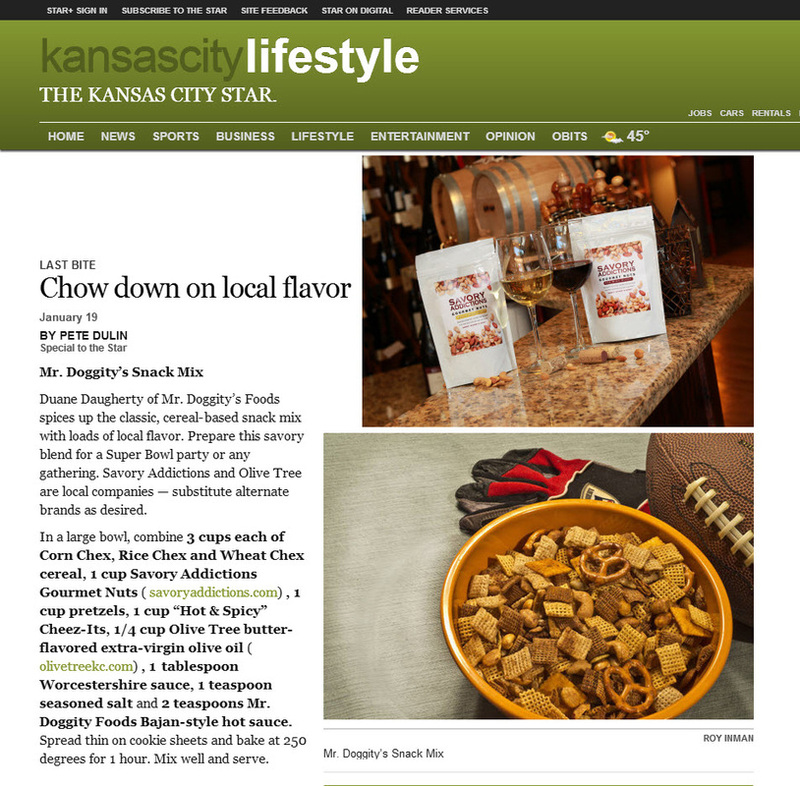 Craig and Gay Jones have always been supporters of the local Kansas City food scene. They are certified Kansas City Barbeque Society judges, disciples of The Kansas City Test Kitchen, have produced video reviews for the annual Kansas City Restaurant Week fundraiser, and are members of the Kansas City Food Artisans and Slow Food Kansas City. They are graduates of the Kauffman Foundation FasTrac® Entrepreneurial program. They live in Lee’s Summit, Missouri. 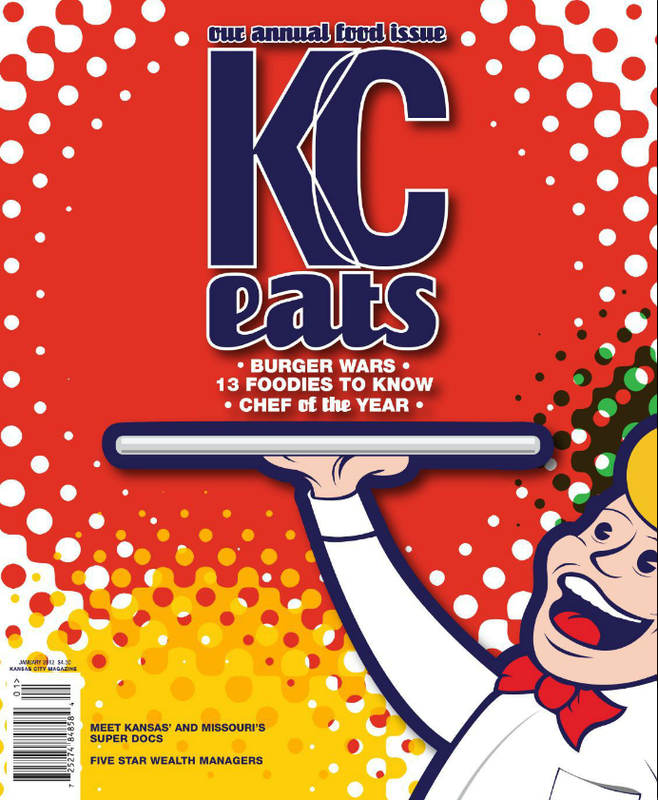 For information on other great food finds in Kansas City, visit What You're Missing KC! 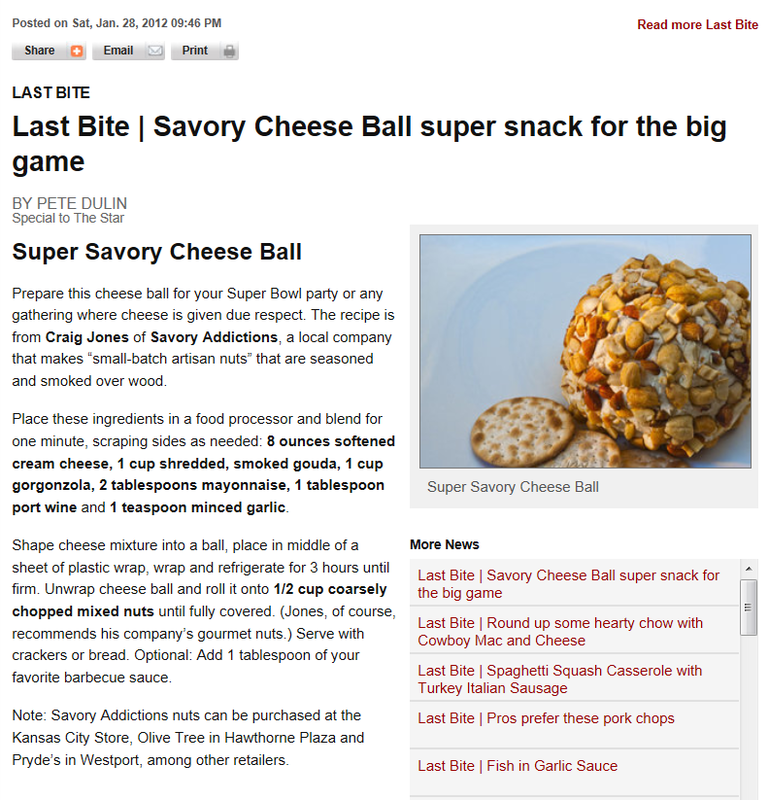 Prepare this cheese ball for your Super Bowl party or any gathering where cheese is given due respect. The recipe is from Craig Jones of Savory Addictions, a local company that makes “small-batch artisan nuts” that are seasoned and smoked over wood. Place these ingredients in a food processor and blend for one minute, scraping sides as needed: 8 ounces softened cream cheese, 1 cup shredded, smoked gouda, 1 cup gorgonzola, 2 tablespoons mayonnaise, 1 tablespoon port wine and 1 teaspoon minced garlic. Shape cheese mixture into a ball, place in middle of a sheet of plastic wrap, wrap and refrigerate for 3 hours until firm. Unwrap cheese ball and roll it onto 1/2 cup coarsely chopped mixed nuts until fully covered. (Jones, of course, recommends his company’s gourmet nuts.) Serve with crackers or bread. Optional: Add 1 tablespoon of your favorite barbecue sauce. 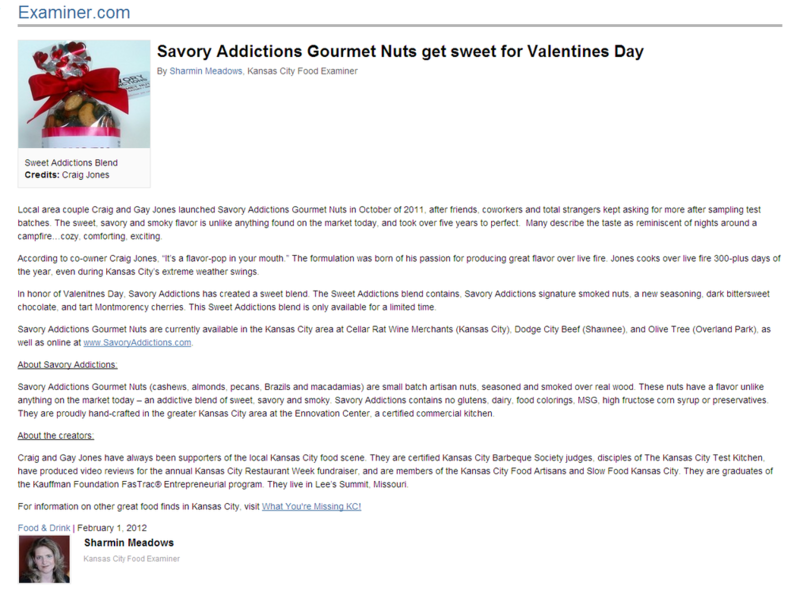 Note: Savory Addictions nuts can be purchased at the Kansas City Store, Olive Tree in Hawthorne Plaza and Pryde’s in Westport, among other retailers. something a fire-safe distance from their menorah. For the smoking enthusiast in your life: Savory Addictions. Gay and Craig Jones apply a spice mix and then wood-roast mixed nuts. The results are smokey, sweet and salty — a seriously grown-up version of bar nuts. For the meat lover in your life: beef jerky from Dodge City Beef (11115 Johnson Drive, Shawnee). This is the kind of jerky that makes you believe that the entire concept of jerky needs to be rethought. You might not be able to rope a calf, but you can still feel like a cowboy for a few bites. For the cook in your life: Walk into Pryde's Olde Westport (115 Westport Road). Tell them exactly how much you have to spend and whether the person in your life is a baker or a cook. Let them ask you a few questions about gadgets and what's in the kitchen currently (you'll have to do a bit of scouting). Then just follow the salesperson and buy whatever they suggest. It will not be the wrong choice. They will wrap it nicely. You will score major points with this gift. I have done this for more occasions than I would care to admit. For those with a sweet tooth in your life: povitica. If you need to ship it and you want someone to have a taste of home, the Strawberry Hill Povitica Company is the way to go. If you're in town, Pallo Povitica offers free home delivery on orders over $25 and will be at the City Market this coming Saturday. Flavor: It’s the addiction you can live with. That’s the mantra of a local area couple who introduced Savory AddictionsTM Gourmet Nuts this month to the delight of Kansas City foodies. Craig and Gay Jones launched the delectable snacks this month after friends, coworkers and total strangers kept asking for more after sampling test batches. The sweet, savory and smoky flavor is unlike anything found on the market today, and took more than five years to perfect. Many say the taste is reminiscent of nights around a campfire…cozy, comforting, exciting. Savory Addictions Gourmet Nuts are currently available in the Kansas City area at Cellar Rat Wine Merchants, Dodge City Beef and Olive Tree, as well as online at SavoryAddictions.com. According to Craig and Gay Jones, there’s a reason they roast those chestnuts over an open fire. 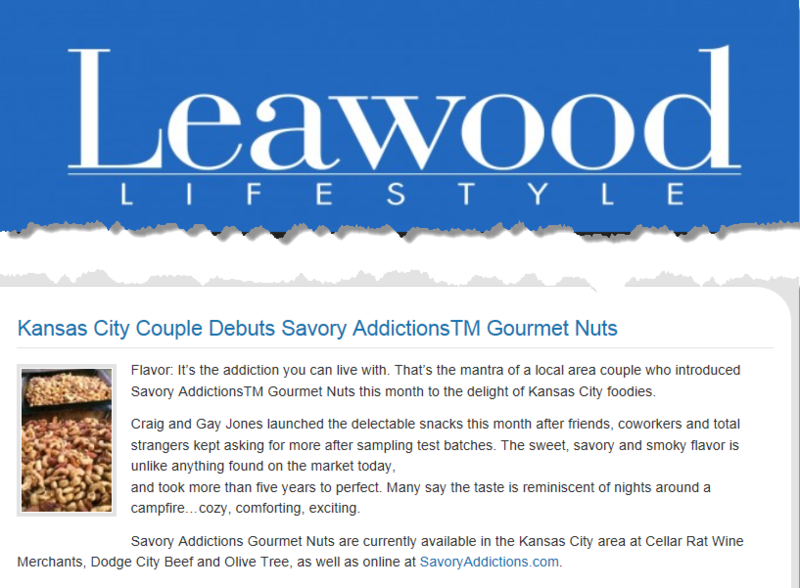 Savory Addictions Gourmet Nuts, a new business formed by the Lee’s Summit couple, doesn’t incorporate any chestnuts into the mixed-nut blend it introduced to the Kansas City area retail market recently. But it does roast every batch of cashews, almonds, pecans, macadamia nuts and Brazil nuts over an open fire. Combined with just the right seasonings, the fire-roasted nuts boast a sweet, savory and smoky flavor that the Joneses decided to market after recent taste tests, Craig Jones said. During the Greater Kansas City Home Show in March, he explained, only two of roughly 500 customers sampling Savory Addictions’ mixed nuts said they didn’t care for them, both because they don’t like anything smoke-flavored. On the other hand, the nuts have attracted rave reviews from people like Ryan Sciara, owner of Cellar Rat Wine Merchants in Kansas City. After trying his first sample of Savory Addictions nuts a few months ago, Sciara wrote the Joneses to say the nuts were “absolutely fantastic” and perfectly named. He also encouraged them to bring the nuts to market and now is among four specialty food retailers carrying them in their stores. 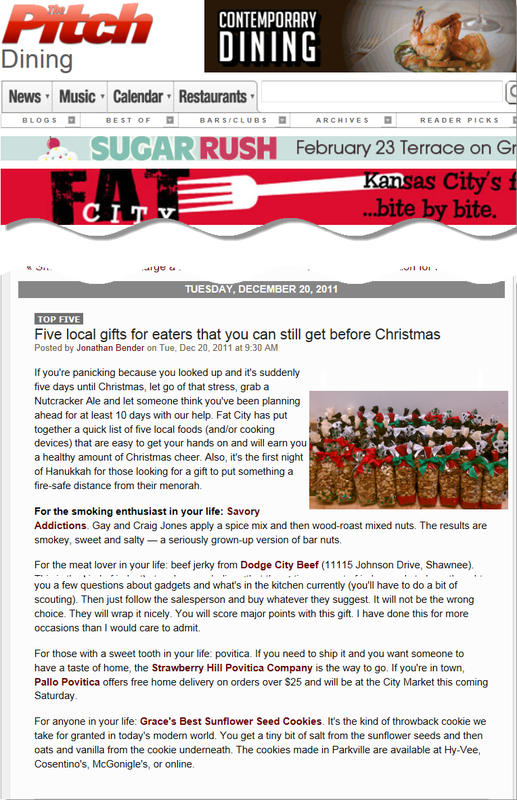 The nuts, also available through www.SavoryAddictions.com, were more recently a hit during the Holiday Boutique at the Overland Park Convention Center, where the Joneses made hundreds of sales during the Nov. 10-14 show. And to think that it all started with a bet. Craig, who cooks out over charcoal and wood more than 300 days a year, accepted the challenge and said “people went nuts” over the flavor he was able to infuse in his roasted nuts. Over the next several months, he continued tinkering with the recipe to make it even more irresistible. And encouraged by the positive responses they were receiving, the Joneses decided to enroll last May in the Kauffman Foundation’s FasTrac entrepreneurial program. “They said that if we could find the right price point that they thought we had a viable business opportunity,” Gay Jones said. So the couple decided to go commercial. The nuts are now roasted, seasoned and packaged in a commercial kitchen within the Independence Regional Ennovation Center, a mixed-use incubator for new businesses that serves the couple’s production needs perfectly, she said. The Joneses don’t have any illusions of making millions from their new sideline, in part because the nuts are too expensive to produce to compete with grocery-store nut offerings.